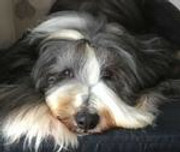 The UK Bearded Collie Website :: View topic - Upset Tummy Please Help!! sulphasalazine and oxytetracycline, ones for the bug and the other is for colitus which he has got cos his tummy is aggrevated. Yes Rusty gets Colitus a lot too.Still give him some live yoghurt though in his food as the good bacteria will help,You should see a rapid improvement now. can u get live yoghurt in the supermarket? Fingers crossed I'l see a quick improvement! another tip...apparently dogs cannot digest cows milk very well, some are fine with the live yogurt tho....but you can get natural live Goats Milk yogurt in the supermarkets now, granted only bigger branches not the tiny Tesco Express sized one's...I use Goats Milk for Merry's cereal meal and the Goats Milk yogurt and now the boys get a spoonful of that ....if your hairy angel has an upset already I would go straight to the Goats Milk yogurt first . Thanks for that, I'm just goin to tesco now so I'l have a look! How is Lewis now ? On the road to recovery now !! Food seems to staying inside him longer now and is a bit of a better shape the other end!! he still has a week left on his tablets but he his definatley showing improvements! Can I sugest add in some steamed pumpkin into hs food. It will harden the output. Bear Bear and Duchess the perfect furkids. Ultimate career path in this life is to be a Canine Hydrotherapist and work with Canines! Whilst walking lewis he passed what I would class as a "normal" one!!! He still has a few days tablets left and then a return trip to the vet to look forward to! Thank you all for the help and advise that has aided lewis to return to good health.